Dozens of companies—from household brands to music-focused startups—plan to begin offering new services in 2014, according to companies that they have hired to help launch and operate them. Communication Inc., that let users create "stations" based on their own taste. A niche service could charge as little as $2.99 a month, while others might allow fans to subscribe for just a week at a time. Some may offer discounted access to music catalogs by not including new releases, said Frank Johnson, chief executive of MediaNet Digital Inc., a Seattle company that will help bring more than 50 new streaming services to market next year. About one-third of the world's music consumers have used music-streaming services of some kind, but only around 10% of music consumers have paid for such a service, according to a recent report commissioned by Vivendi SA VIV.FR +1.62% 's Universal Music Group and conducted by Midia Consulting. While Spotify and Pandora have built sizable followings, many of the other existing competitors in subscription-based music-streaming services have failed to gain significant traction, and few disclose subscriber numbers. Current services include Rdio, Sony Corp.'s 6758.TO -0.67% Music Unlimited, Rhapsody and Rara, a London-based service that entered the U.S. in 2011 and is now integrated into a range of BMW cars. That is an encouraging fact for new music-streaming startups. "The percentage of the population that uses these is still really small," said Mr. Johnson of MediaNet. "There's a long way to go before you saturate the market." Of course, down the road there could be a painful shakeout. Meanwhile, the flood of new entrants highlights how record companies have embraced the business of renting music to people online, even though some believe the new approach could cut into sales of downloads. By giving so many newcomers the rights to use their music, the labels are betting that subscription services can help return the industry to prosperity and attract fresh investment with more predictable, if modest, returns that come from reliable monthly fees instead of volatile record sales. It has the makings of a monumental shift for an industry known for clinging to its old ways, and one that notoriously failed to create a sustainable digital business model when fans starting sharing music on sites like Napster more than a decade ago. Since then, U.S. recorded music sales have plunged nearly 43%, according to Nielsen SoundScan. Revenue from streaming and subscription services—$1.25 billion world-wide last year—has helped to curb further declines since 2011. Music executives expect revenue growth from subscription services to quicken if more wireless carriers and cable-TV providers start bundling music subscriptions into customers' monthly plans. Such bundling has been attempted around the world with uneven success. About a quarter of Leap Wireless International Inc. LEAP -0.11% 's Cricket Wireless customers subscribe to a plan that includes a subscription to Muve Music, for example—but it is still challenging to convince telecoms that adding music will reduce customer defection rates. Despite their enthusiasm, big record labels don't always make it easy to license their music. The process can still take at least a year, technology executives say, and they often demand large, upfront guarantees. But there are now a handful of companies that help aspiring music streamers navigate the process. London-based 7digital Ltd. has launched music-streaming services for Samsung Electronics Co. 005930.SE -0.85% and Pure, a British consumer-electronics maker owned by Imagination Technologies Ltd. IMG.LN +0.96% that began selling its new sound systems—embedded with on-demand streaming—last month in U.S. stores. Vickie Nauman, president of 7digital, expects to bring at least three more services to market next year. Ms. Nauman, who negotiates with record companies on clients' behalf for the rights to use their music, declined to name them but said that one was focused "on a very specific type of audience" and another on a particular type of music. Fans of country music, blues and jazz, classical and opera have been particularly underserved by streaming services so far, said Ms. Nauman, as has "the casual music listener—the person who really just wants a button and doesn't want to make a playlist." "You look at all of these services, they're almost all exactly the same, targeting exact same consumers. You don't have to be a genius to say, what sense does it make to try to do the same thing? We're trying to filter companies by how they're bringing audiences into the market that aren't already on these." The risk, she said, is that "if a person subscribes to a service and it fails a year later," sites that offer free music could begin to look more attractive, and streaming could lose its momentum. Beats Electronics LLC, the headphone maker founded by music mogul Jimmy Iovine and rap star Dr. Dre, aims to address that issue with the January launch of a service called Beats Music. It will focus on guiding mainstream audiences to music they know and helping them discover new music. Google Inc. GOOG +0.08% 's YouTube is planning to roll out its own music-streaming service that will let paying subscribers watch music videos without ads. The YouTube service also will serve up music without video and allow mobile users to stream tunes while texting or surfing the Web. Google launched another, music subscription service, Google Play All Access, earlier this year. Subscribers will automatically get access to the forthcoming YouTube service as well. 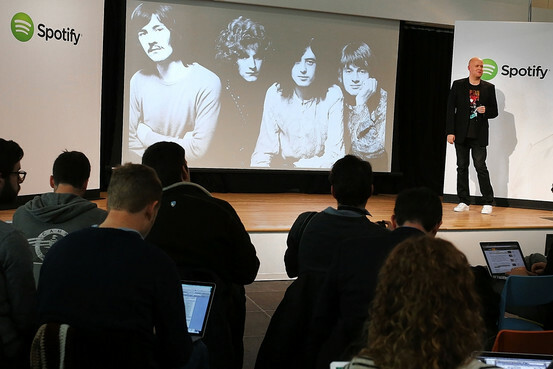 Another service, France's Deezer, plans to launch in the U.S. next year. 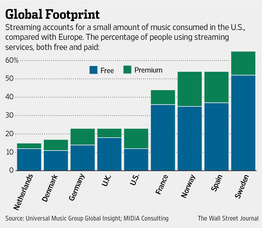 Do Streaming Music Services Have a Sustainable Business Model? Multiple Music Streaming Services Look to Take Off in 2014, What Can They Do to Catch Up to Pandora and iHeartRadio?